It's been a very long time since I last posted a nail art post. 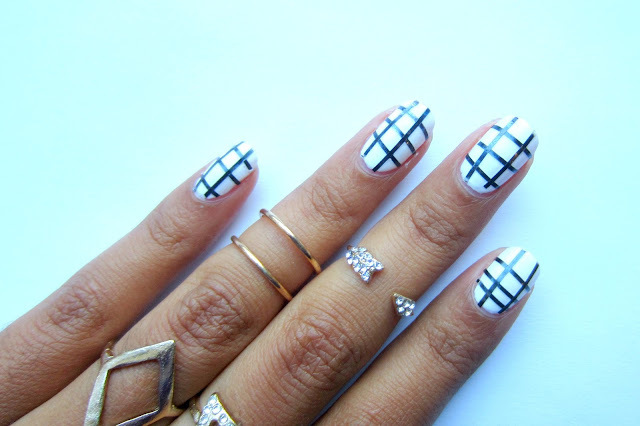 Lately, I have been in love with black and white designs and I received in the mail a set of nail art tape from ebay. I was dying to try it and decided to do an easy everyday nail art. It's super simple as all you need is a base coat, white nail polish, black nail art tape and a top coat. I started off by applying a base coat to protect my nails and then I applied 2 coats of Essie's Blanc nail polish (My current favorite white nail polish). Make sure its completely dry and I applied 3 horizontal strips of black nail art tape on my nail and then 2 vertical stripes of nail art tape. After that I applied 2 generous layers of top coat as this is what ensures that the tape will stay on my nail and not peel off. You can definitely do this with a nail striper tool and create the lines with black polish as well if you do not have nail tape. I love doing this nail art as its very simple to do especially with the tape and I get tons of compliments on my nails. Color correcting is a makeup technique that is so important if you have discoloration like acne scars, dark spots and dark under eyes. You may need to color correct if you notice that you apply foundation and concealer and you find that your acne scars and discoloration show through it. 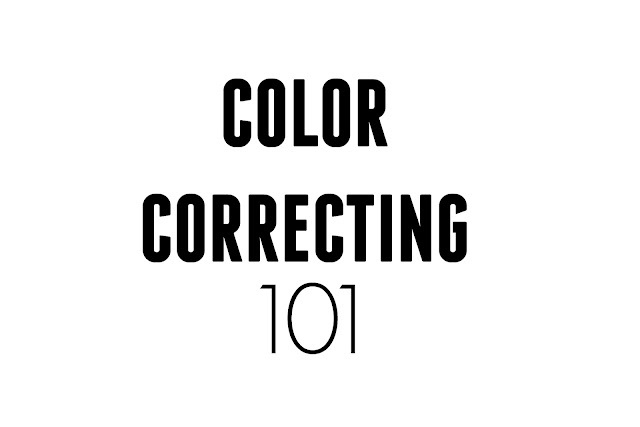 Color correcting helps hide discoloration and you use less concealer and foundation when you color correct under it. How do I color correct? You have probably seen tons of color correcting palettes in stores with of different shades like lavender, yellow, green and orange. You probably wondered "what the hell do I do with this?" These different shades actually counteract the color of the discoloration that you want to hide. It's based off the makeup color wheel as the colors that are opposite each other neutralize each other. Following color theory, red under-eye circles, red acne scars and pimples will require a green concealer to neutralize the red. Blueish purple under eye circles will require a orange concealer. Dark spots and dark discoloration will also require an orange concealer. You apply the appropriate concealer on the area, blend it out and then apply your concealer and foundation. I love to color correct to neutralize my red under-eye circles and acne scars and as a result I use less foundation and concealer to cover them up. I use my NYX concealer in green and I apply it with my Avon mark flat concealer brush. My drugstore picks are NYX concealers and L.A girl HD concealers. I love the formula and they have a good color selection. L.A girl has a huge color selection though and they also have 3 color correcting shades. At $3 a pop, you cannot go wrong with them. NYX has liquid HD concealers and concealers in a jar. I have tried them both and love them. NYX also has the correcting shades but L.A girl beats them when it comes to a large shade selection for all skintones. NYX concealers retail around $6 and those are the ones that I currently use (I have gone through 5 of these). 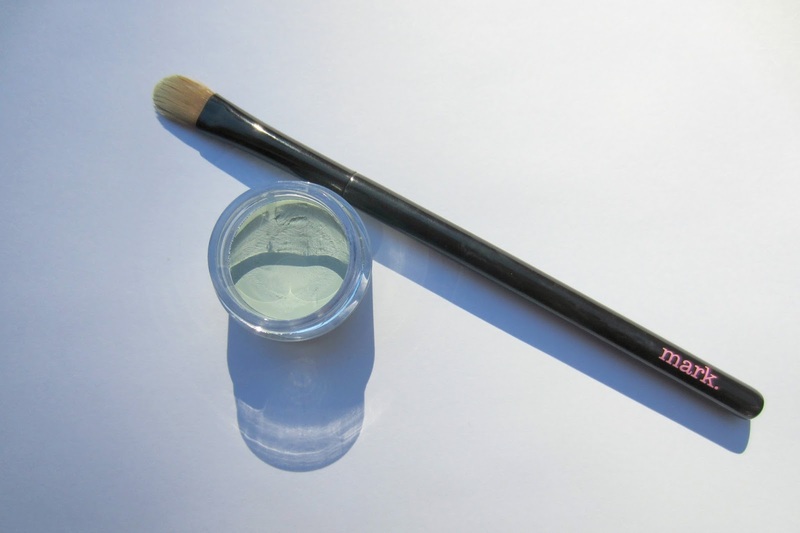 Color correcting is an indispensable technique for those who have discoloration such as myself and you'll find that it will make a huge difference in your makeup. 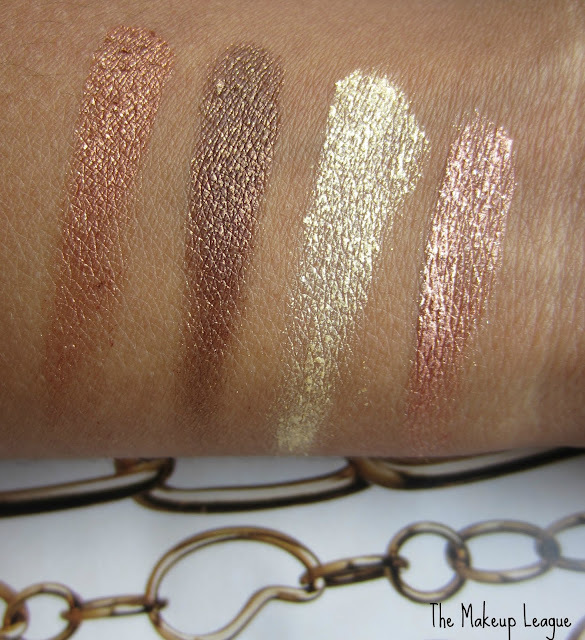 Review & Swatches | Milani Fierce Foil Eyeshine "Florence"
I am in love with this Milani Fierce Foil Eyeshine palette. As soon as I saw this palette in CVS, I knew I had to have it. There are 3 other palettes in this collection. The palette that I purchased is Florence which consists of bronzes,browns and golds. I bought this at CVS for $9.99. The Milani Fierce Foil Eyeshines are basically glittery eyeshadows that have a cream consistency. When I first bought it I thought that they were foiled eyeshadows but clearly I was wrong. There is a flat tip plastic applicator included with the palette which I actually use. It helps me pack the eyeshine on my lid (probably the first time that a drugstore e/s applicator proved to be very useful). These shadows aren't very opaque as they're glittery- these eyeshadows give a lovely shine to the lids. These eyeshines are supposed to be worn on the lids- I can't see someone using this in their crease.You can apply them with the applicator or your finger and then use your finger to blend them. These Eyeshines are also long wearing- it lasted more than 10 hours on my lids and it still looked amazing at the end of the day! You may experience shorter wear times if you have oily eyelids and depending if you use a primer. The top left eyeshine is a copper gold color, top right eyeshine is brown, bottom left is a yellow gold color, and the bottom right is a lovely rose. My favorites are the rose and copper colors- they look so gorgeous on the lids. The brown eyeshine looks great for a shiny brown smokey eye. The yellow gold color is nice but I mostly use it as an inner corner highlight. 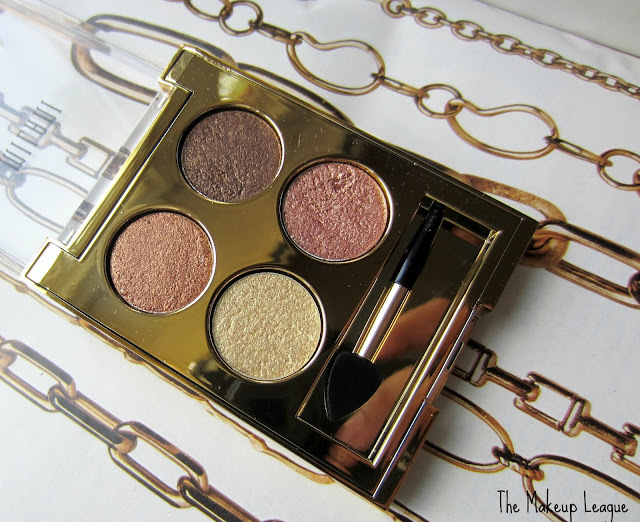 I have posted a look using this palette (HERE). I love this palette and it is so different from other palettes that I own. I definitely plan on getting more of these palettes and if you love neutrals and shimmery shadows then you will definitely like this. S'more Fun was released in the The Great Outdoors 2015 collection. As soon as I saw a swatch of this polish on twitter I knew I had to have it. 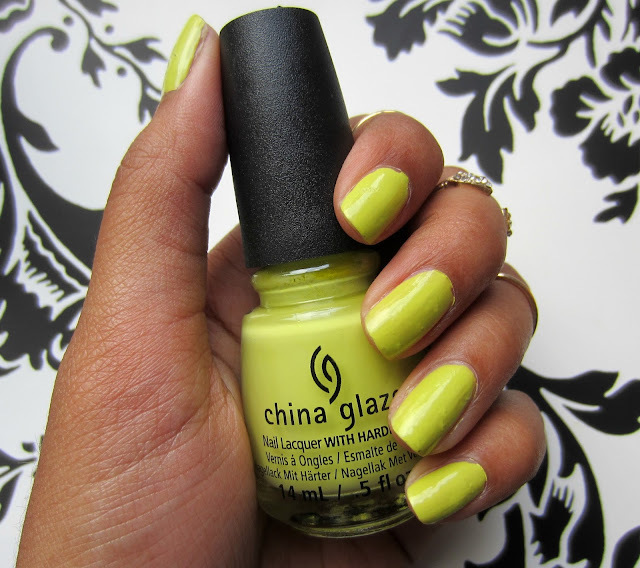 I love bright fun nail colors and this one is right up my alley. "China Glaze, The Great Outdoors Collection: Adventure, camping, caves, crystals, exploration, forest , nature and wilderness. Reconnect with nature. Unplug and enjoy your surroundings. Stop and smell the roses. This collection inspires you to ground yourself again, for even just a moment, with the wondrous world around us, that we lose sight of in the hustle and bustle of everyday routines. Find the treasure in nature that shimmer, sparkle and wow you! Contains China clay as a nail hardener. Free of DBP, toluene and added formaldehyde." S'More Fun is a lime green color with a creme finish. For full opacity, three coats are needed. I'm sure it will look much brighter with a white polish applied underneath as a base. The formula isn't the greatest considering how much it retails for- I get about 3-4 days before I notice significant wear. I purchased this at Ulta for $7.50 but you can buy this online for much cheaper from sites like Amazon for as low as $3. Overall, I love this color and I wear quite frequently but I wish the formula was improved. P.S Currently, Ulta has a BOGO Free sale on this collection. Go Go Go! Have you tried any nail polishes from this collection?